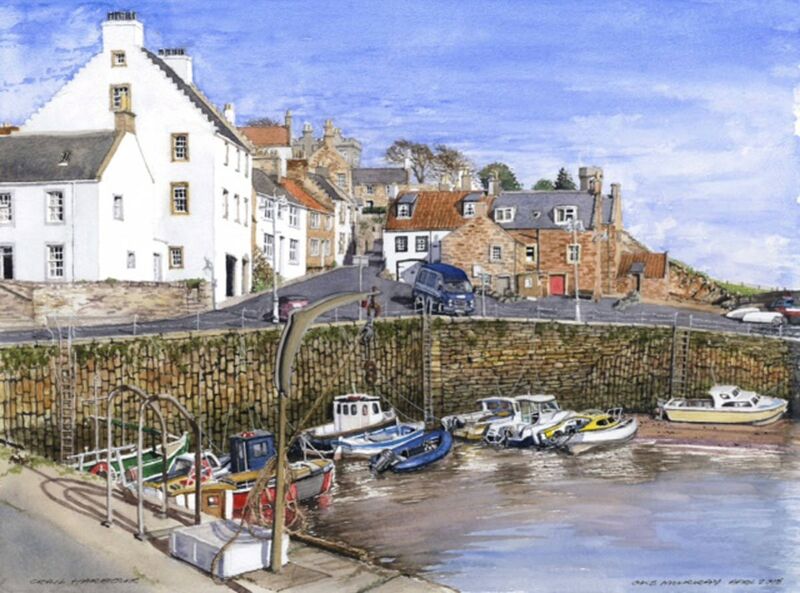 ﻿With ﻿spring ﻿well ﻿under ﻿way, ﻿Pittenweem ﻿welcomes ﻿you ﻿to ﻿its ﻿Easter ﻿open ﻿studios ﻿event. ﻿The ﻿village ﻿is ﻿known ﻿for ﻿its ﻿many ﻿artists ﻿who ﻿live ﻿there ﻿and ﻿who ﻿form ﻿the ﻿core ﻿of ﻿the ﻿annual ﻿festival ﻿in ﻿August. ﻿Each ﻿Easter, ﻿around ﻿a ﻿dozen ﻿studios, ﻿houses ﻿and ﻿galleries ﻿around ﻿the ﻿village ﻿exhibit ﻿their ﻿latest ﻿collections. 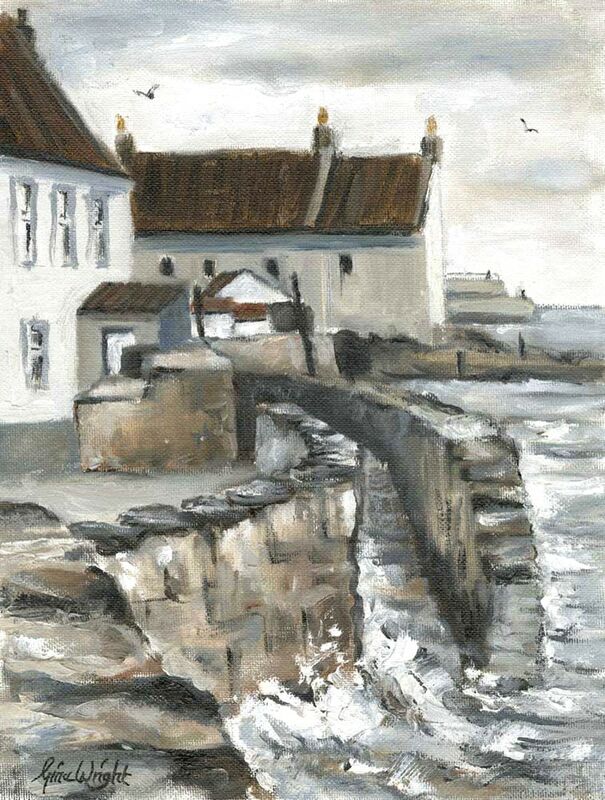 ﻿Pittenweem’s ﻿beautiful ﻿coastal ﻿setting ﻿and ﻿landscape ﻿has ﻿always ﻿attracted ﻿artists ﻿and ﻿visitors. ﻿The ﻿village ﻿offers ﻿an ﻿enjoyable ﻿day ﻿out, ﻿with ﻿cafes, ﻿eateries ﻿and ﻿of ﻿course, ﻿art. 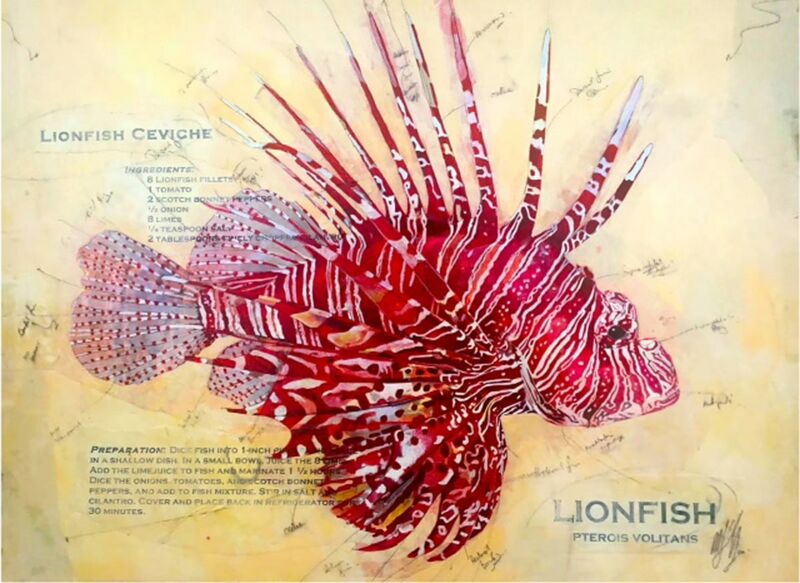 Paintings and drawings by Jan Fisher in the Fisher Studio 11-13 High Street (formerly the Fisher Studio & Gallery). Exhibition open 10 - 5 throughout the Easter weekend. The Weem Gallery opens with an Easter exhibition showing paintings by Jane Askey and Glenn Murray. 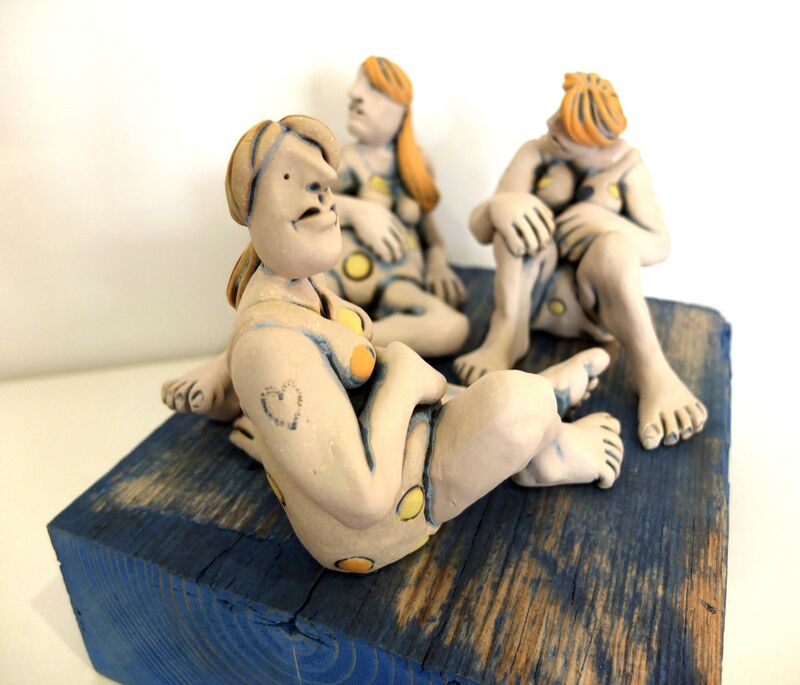 Backgate Gallery will be showing new work by Susan Forsyth. Also a new exhibitor to Pittenweem, Wayne Galloway ceramics; as well as Jacquie&apos;s vintage cup candles, and resident artist The Fish Tailor. 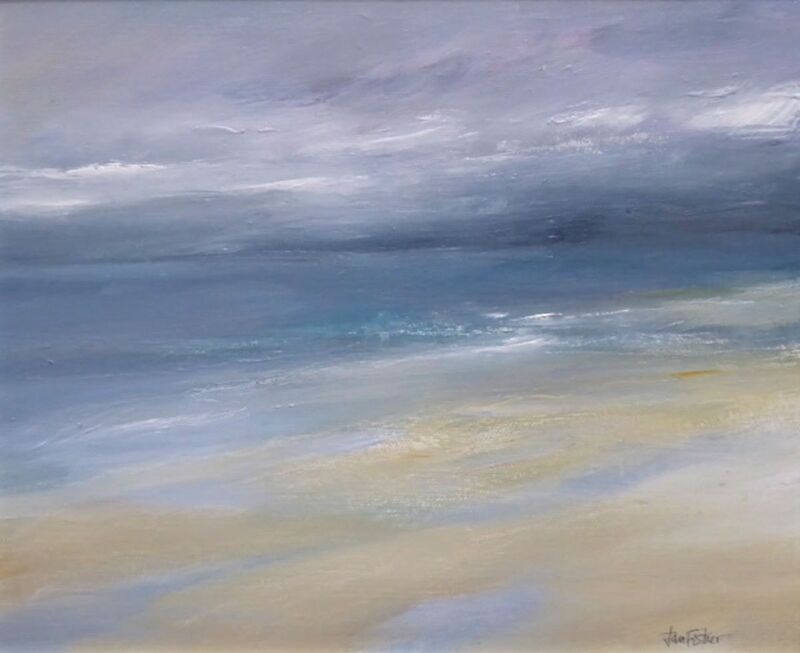 Gina works outdoors in oils or pastels: I love all aspects of the natural world around me and strive to express moments in time through my art. 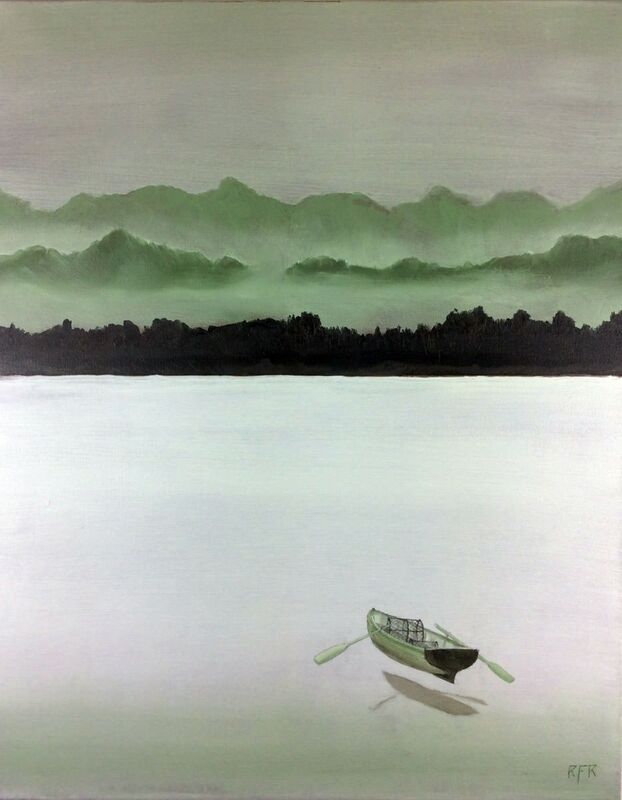 A solo show by Susan Winton of Cobalt Contemporary, showing for Easter at ART@47. 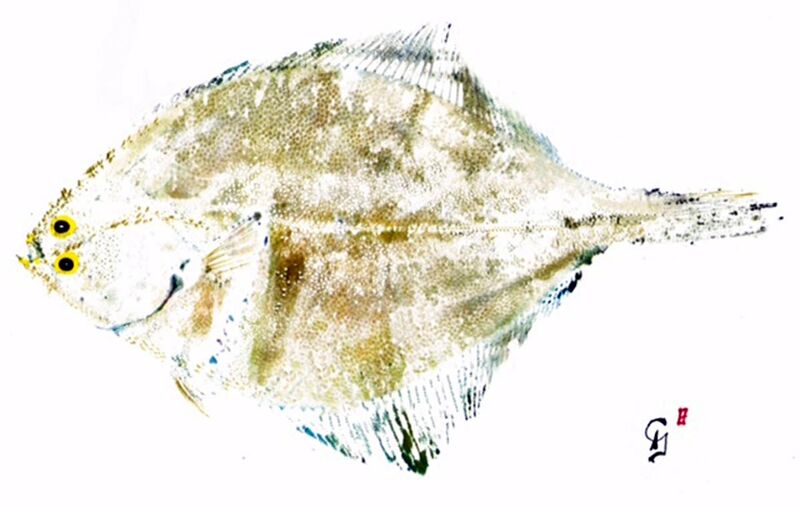 The Dory Bistro & Gallery exhibits the work of several local artists, including co-owner Malcolm Cheape. Enjoying some quiet time, making a variety of work inspired by the harbour colours and my experiences of growing up here. An affordable collection of new pieces. John Baker’s enthusiasm for experimentation and creativity is reflected in the originality and range of his work. 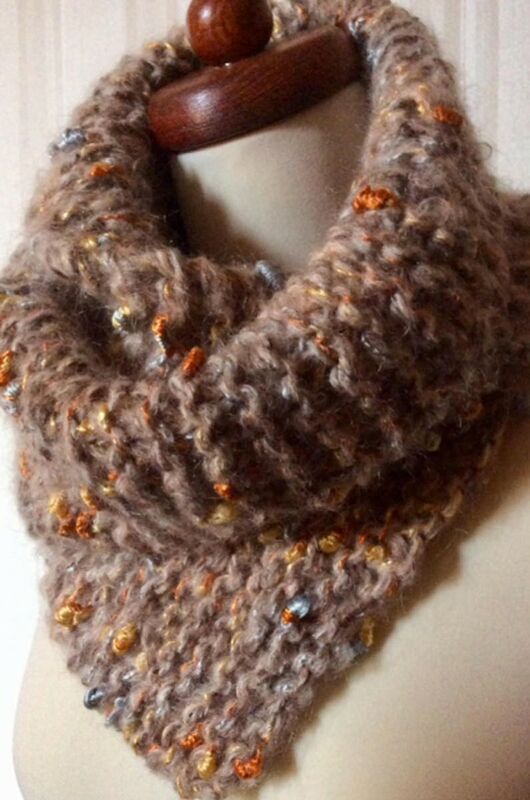 Rich, warm colours in jewellery and hand knits. Paintings in both realist and atmospheric style. 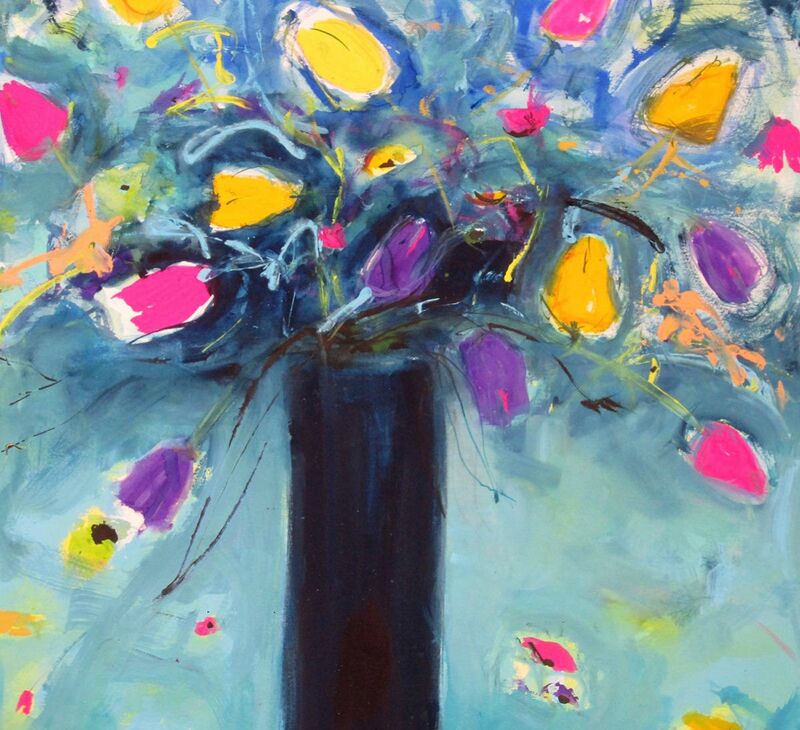 Marlene’s love of colour is expressed in her still life or landscapes. Her collages are unique, using a variety of materials. Known to dedicated and discriminating shoppers who have a flair for fashion and style. 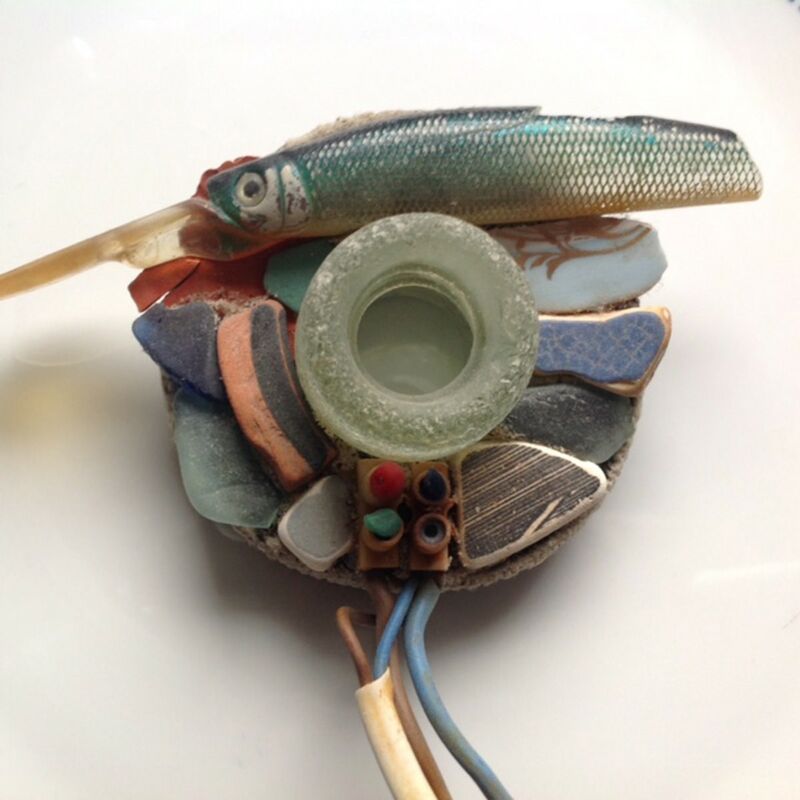 Caroline makes shell art and necklaces from semi-precious stones. Strictly speaking, not true but it is the first complete gallery entry. The accolade goes to John Baker’s Artick Design Gallery & Studio. I’ve used as a sample the Cellardyke Harbour image as it includes our flat; not further identifying it as we’re popular enough already. With the submission date of March 15th for artist registrations not too far off, we’re getting an increasing number of submissions; over 60 so far, creeping up to the final 130+ of last year. Along with familiar names, such as Colin Jack (see January below) we welcome new artists, such as Madeleine Hand, to the Festival. Nope, it had never really occurred to us to stage an exhibition on the Isle of May. 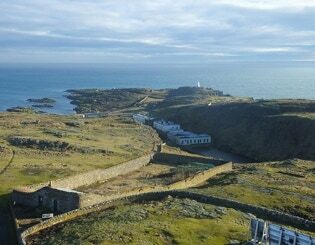 We were therefore surprised and immediately thrilled when Sarah Eaton of Scottish Natural Heritage, who have responsibility for the island, approached us in January of this year with the proposal to host an exhibition in the May’s lighthouse. The first consideration was, who would we exhibit? We realised that in the time we had available we couldn’t organise a solo exhibition: no artist could put together a show in just a few months. Mind you, artists we talked to, whose work we thought would be very suitable for the May, were very interested and enthusiastic. The best idea was a group show which we decided to restrict to Pittenweem artists and galleries, giving them the remit to make their work link in some way to the lighthouse and the May. 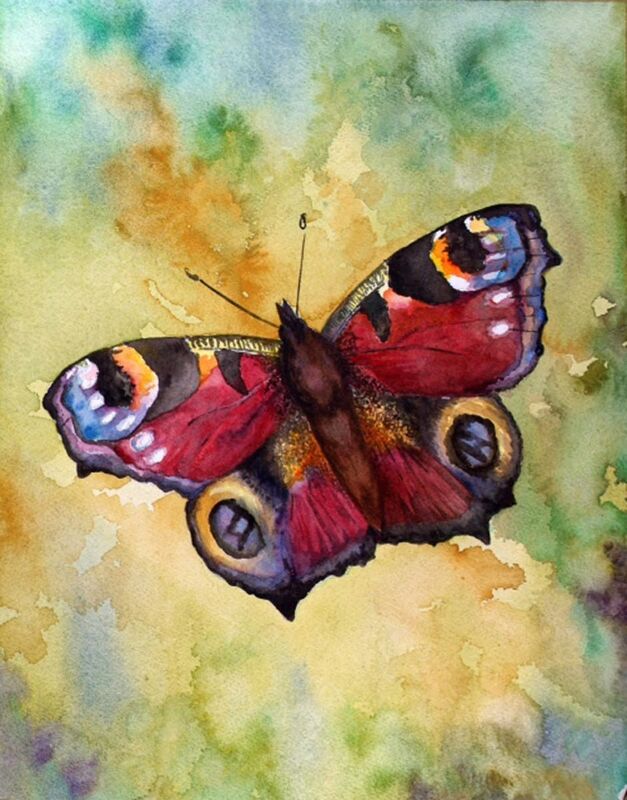 This has proved to be very successful with over thirty artists responding. Sarah had said that we could have two adjoining rooms, so that was a nice way to break up the exhibition but we had to see for ourselves. Before organising the work we had to visit the May to see what the exhibition space would be like. Previous visits to the Isle of May had been at more clement times of the year when vegetation and puffins abounded; January is a different matter. Undergoing any trials in the name of art, we set off in the Osprey RIB on what was a really mild and gently hazy day. The outbound trip was fine though coming back we got comprehensively soaked; we hadn’t realised that the Osprey could go at 60 knots an hour. (Okay, it felt like that and it slammed into the waves). As you can see from the photographs, the island looks a bit craggy but when you visit in May onwards when trips are available, it’ll be greener, more active with wildlife and differently striking. We’re really enthused with everything about this project and are grateful to SNH for giving us this opportunity to provide a unique outreach for the Festival. Click here to see Dominique’s entry for the 2019 Festival. ﻿We ﻿were ﻿accompanied ﻿on ﻿our ﻿trip ﻿by ﻿Pittenweem ﻿artist ﻿Dominique ﻿Cameron ﻿who ﻿has ﻿arranged ﻿with ﻿SNH ﻿to ﻿put ﻿on ﻿a ﻿solo ﻿show ﻿themed ﻿around ﻿islands, ﻿in ﻿2020. ﻿Colin ﻿Jack ﻿has ﻿long ﻿held ﻿the ﻿distinction ﻿of ﻿being ﻿the ﻿first ﻿exhibiting ﻿artist ﻿to ﻿submit ﻿his ﻿registration ﻿form ﻿and ﻿images. ﻿And ﻿this ﻿year ﻿he’s ﻿done ﻿it ﻿again. ﻿Many ﻿thanks ﻿Colin ﻿for ﻿helping ﻿out ﻿by ﻿getting ﻿this ﻿material ﻿in ﻿early. ﻿Regular ﻿admirers ﻿of ﻿Colin’ ﻿work ﻿will ﻿notice ﻿that ﻿there’s ﻿a ﻿difference ﻿in ﻿style. 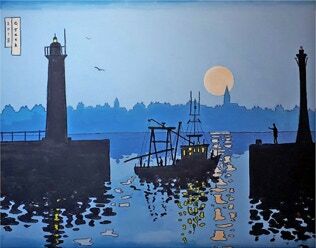 ﻿It’s ﻿recognisably ﻿Anstruther ﻿harbour ﻿but ﻿done ﻿in ﻿the ﻿Japanese ﻿ukiyo ﻿style. ﻿Not ﻿everything ﻿has ﻿changed ﻿as ﻿the ﻿familiar ﻿style ﻿will ﻿also ﻿be ﻿on ﻿display.